The sighting reports derive from a number of sources, from officers themselves to historical newspaper archive reports and to official information reports released by the Ministry of Defence. As an off duty female officer, WPC POTHECARY was cycling near to Netley Railway Station on her way to work when she observed an orange coloured sphere on the road directly in front of her. It was approximately 4 feet in diameter. Initially she hid behind some nearby buildings and watched the object which made no sound whatsoever as it landed in a railway goods yard. After initially being frightened she slowly moved toward the object. She got right up to the object and was actually able to picked it up. It was very light in weight. Thinking she ought to take it to the police station where she worked (Netley) she picked it up and managed to hold it with one hand as she cycled toward her home station. However within feet of moving the object it began to decrease in size until it had completely disappeared. Given the fantastic nature of the incident she decided (in the absence of the object) not to report the sighting as she feared ridicule from her colleagues. A uniformed police officer, PC ALAN DIGWEED had just gone off duty when he saw a brilliant light over Dungeness. At first he thought it was the air sea rescue but when he contacted them he was told it was not them. A short time later the light vanished. Kent radar contacted him and confirmed that they had briefly picked up unidentified traffic at the time he saw the UFO. He said, “I’d always been sceptical up to then but there was something in the sky and no one knows what it was.” He went public with his sighting when he published it in the Kent police magazine ‘Patchwork. Whilst on sick leave at home with his family a uniformed police officer, PC DONALD CAMERON reported seeing six UFOs above his home on Chilton Road. He and his wife were looking out of a window when they spotted the objects which he estimated as being approximately one mile away travelling in a south-easterly direction. He said, “We could see it quite clearly, although it was a dull day. They were white and glowing. One was bigger than the others with a cup shaped dome. The others were oval.” UFO CLASSIFICATION – NL (NOCTURNAL LIGHT). Off Duty sighting.1 Officer. Source – UFO Flying Saucers over Britain by Robert Chapman. Mayflower Books 1969. Page 43. Location – Lytchett Minster, Dorset. Two uniformed officers were in their respective police houses when a member of the public reported that a cigar shaped UFO was hovering above the above named village. One officer came out of the house with the witness and initially observed nothing of note. Then the UFO reappeared into view. However, according to the witness its shape had changed. It now appeared as several bands of red, green, yellow and blue. As a result another officer came out of his nearby police accommodation to witness the same object. The object had initially been reported as being 70 feet in length, coffee brown in colour with yellow lights on its length as well as what appeared to be a series of windows. It was reported to have been hovering at an altitude of only 200 feet. After watching this object for several minutes the officers then observed the UFO changing shape for themselves. The UFO ‘split’ into two and the two halves positioned themselves vertically above each other in the air. After a couple of minutes the objects faded from view before reappearing once again. Moments later the objects began to move away, slowly at first before a sudden burst of acceleration took them out of view. UFO CLASSIFICATION – NL (NOCTURNAL LIGHT). Off Duty sighting. 1 Officer. Source – UFO Flying Saucers over Britain by Robert Chapman. Mayflower Books 1969. Pages 19-20. Location: Canewdon near Southend, Essex. An off duty police officer, PS CHRIS BEARD was fishing when he saw two red lights approaching in the distance. He initially assumed the lights to be that of an aircraft however as they grew closer he realised that they were independent of each other. Against a clear night he was certain that what he was looking at was extremely unusual. The objects eventually passed directly overhead and he heard a faint ‘whirring’ noise. It was last seen heading in the direction of Southend. Humberside. An off duty uniformed police officer was at home in his garden on a clear summers evening when he became aware that several neighbours were looking up at the sky. When he looked up he saw a silver round object high in the sky at an approximate altitude of 5000 feet which was stationary for approximately 20 minutes before it suddenly vanished from site. The officer ruled out a balloon, star or a planet. Late evening near midnight. 11/06/72. Location – Ogmore Valley, Glamorgan, Wales. Off duty officer PC DAVID HARRIS was out walking with his dog with his father in law when they observed a tubular object some feet in length moving slowly across Llangeinor Mountain before disappearing over treetops. The altitude of the UFO was described as 100 feet from the ground. There were lights as each end of the object but no wings were observed. Weather conditions at the time were clear and no noise was heard at any time. The duration of the sighting was one minute. After completing his duty DETECTIVE SERGEANT NORMAN COLLINSON was driving home along the M62 and M66 motorways. As he turned north onto the M66 he observed a white disc of light moving very fast which crossed the path he was travelling. The object was heading toward Knoll Hill, east of Bury. The UFO made a right angle turn onto a south to south-east heading. The object was heading in the direction of Heywood. Puzzled the officer stopped his vehicle and got out to look at the light. As he did so the light stopped and hovered near to his location. It then began to perform a series of spectacular ‘box’ right angle turns. The UFO began to move off in the direction of Heywood once more with DS Collinson following it in his car. The object stopped a second time and again repeated the angular movements described earlier before streaking away at a tremendous speed out of view. The incident was reported to the MOD and Manchester Airport. An off duty uniformed officer, PC BRYAN McCANN, was out driving with his wife when they observed a cigar shaped UFO hovering in a stationary position between the villages of Walcote and Swinford. It was approximately 400 yards away from their location and held its position for four minutes. The object was described as having four brilliant lights and being large in size. The officer dashed home to get his binoculars but by the time he returned to the scene the object had departed. He reported the incident to Bitteswell Air Control. He received confirmation from them that another controller had witnessed the same object the same night. PC JOHN OWEN observed a dome shaped UFO whilst off duty at home with his wife. The object appeared to have portholes and be part of a structured aerial craft. He described the colour of the object as that of the setting sun. He made checks with RAF Valley who confirmed there were no night flights. The incident was reported to his police HQ at Colwyn Bay. Duration of sighting – 7 minutes. An off duty uniformed police officer observed a huge cross shaped UFO above the M5 motorway at the rear of his home in Tewkesbury having just completed a 2-10 late shift at Cheltenham Police Station. He heard a swishing noise outside his home which attracted his attention. Going into the garden he saw the object slowly rotating above the quiet motorway. He described it as the size of a civil airliner and watched as it began to move across fields towards his home. It was moving at a low altitude of 50 feet above the fields and he observed that there was a red light at the centre of four cross arms . At one point the object turned on its side to reveal that it was very thin in depth when viewed side on. For reasons he doesn’t understand he rushed inside to get a torch. Once back outside he used it to flash once at it. The UFO appeared to react and moved slowly back over the motorway where it performed an extraordinary manoeuvre. He watched at one arm of the cross remained in a stationary position whilst the rest of the craft rotated around its axis. A short time later the object moved into the distance and out of site. Forms part of a series of four sightings made by the officer. Location – A38 Tewkesbury to Coombe Hill, Gloucestershire. The off duty uniformed officer was on his way to work at Cheltenham Police station driving along the A38 when he heard a ‘clanking’ noise outside. From his left he saw a three pronged UFO which appeared to have a ‘barbell’ on the end of one of its arms. The object was described as the size of a civil airliner and was moving slowly at a low altitude. The craft came to a hover above the village of Deerhurst. The barbell appendage appeared to be transparent and as he watched it his mind filled with the image of a humanoid figure. For reasons he can’t explain he flashed the car headlights at the object and the figure disappeared as did the craft. The duration of the sighting was two minutes. This forms part of a series of four sightings by the officer who is now retired from the Gloucestershire Force. Weather – dry, fine and clear. Location – Isfield near Lewes, Sussex. Whilst waiting at bus stop a female off duty uniformed officer observed a dome shaped UFO at a low altitude of 300 feet. She described the object as having the appearance of a light or green coloured metal with a moderately reflective surface. On top of the dome protruded a blue/green light whilst underneath there was an area of intense black. For reasons she doesn’t understand she waved at the object and it passed to within 50 feet of her position. The next thing she remembers was the bus arriving and that when she tried to move her limbs felt numb. She also noticed that she had developed an acute headache. Over the next week she developed other ailments including thirst and conjunctivitis. For a time afterwards she suffered with recurring bouts of gastric problems. She cannot account for a period of 20 minutes of time whilst stood at the bus stop. She has not had any form of hypnotic regression. She was a former member of the Royal Observer Corp.
An off duty uniformed Gloucestershire officer observed a large UFO in the vicinity of Orchard Road and Hesters Way, Cheltenham whilst out with his then wife. He described the object as a flying cross which was the size of a jumbo jet aircraft and that it came to a stationary position above a Catholic church. The object was seen at a low altitude of 50/100 feet. On one of the four arms he observed a red light that flashed four times before disappearing from view. The weather at the time was dark, fine and clear. Forms part of a series of four sightings reported by the officer. Inspector DESMOND CONDON reported seeing a hovering UFO over Earlsfield, south-west London at an approximate altitude of 3000 feet. He said, “It was a perfect pillar, it glowed with a bluish haze and stayed motionless for 30 minutes. I’ve never seen anything like it!”. UFO CLASSIFICATION – NL (NOCTURNAL LIGHT). Off Duty sighting. 1 Officer. An off duty Special Constable, JOHN CLAYTON was travelling in his car from his home in Coton-in-the-Elms to Burton on Trent when he passed through the village of Rosliston he heard a droning noise that caused him to stop the car. When he looked upwards he saw what he described as a ‘flying hotel’, five storeys in height with windows on each storey all lit up. It appeared black in colour and was approximately 250-350 feet in length! The object was moving slowly towards Swadlingcote and Ashby at an altitude of only 500 feet and at a speed of 10 mph. It eventually gained height and disappeared over Ashby in the east. An off duty uniformed officer was with his wife whilst driving along the A60 between Cuckney and Warsop. As they reached the top of Cuckney Hill he noticed a mass of red, orange and white lights high in the sky at an approximate altitude of 30,000 feet. It was a clear night with stars clearly visible. The lights appeared extremely odd and remained totally stationary in the sky for some 20 minutes before they had to leave the area. He did not report the incident. Off duty sighting. 1 officer. Source – PRUFOS Police Database. Classification – Nocturnal Light (NL). Location – Forfar, Tayside, Scotland. Whilst at home the officer saw a strange orange light in the sky. It moved away and faded from view. Moments later it reappeared much brighter than before. He could now see a series of four lights on it. The UFO appeared to be hovering above a gas compression plant approximately 2-3 miles distant. So curious was he about the object he awoke his wife and neighbours who also witnessed the light. His neighbours viewed the object through binoculars and described it as an oval rugby ball shape with a glowing white top. The officer rang Forfar police station but enquiries with nearby airports proved negative. An off duty uniformed inspector observed multiple red lights over Colchester. Sparks were seen trailing behind them. Numerous members of the public also reported similar lights as they passed over the Chelmsford and Basildon areas. One Officer. Off duty sighting. Source: MOD Files. March 1981. Cracoe Fell near Skipton, North Yorkshire. A police officer’s wife reported seeing three lights above Cracoe Fell and alerted her husband who with another officer took a photo graph of the lights. They watched the lights for an hour. The picture was sent to Graham Birdsall, the editor of UFO Magazine who launched a secret investigation into its authenticity. The photograph was later examined by a specialist photo lab in America called Ground Saucer Watch. They confirmed the authenticity of the picture. The lights were estimated to be a total length of 60 feet and were seen at a distance of approximately 50 metres. Details of the sighting and the photograph were only released to the public in August 1983, almost two and a half years after the event. A UFO sceptic researcher later claimed that the officers had witnessed a natural phenomena, that of shining rocks—a rare phenomena and to date no-one has managed to replicate the photograph so I’m not convinced. Location: Carleton Moors near Skipton, North Yorkshire. Two uniformed police officers observed a large glowing oval shaped UFO as it moved over the moors. Location – Todmorden, West Yorkshire. An off duty uniformed officer was out with his girlfriend when they observed a large orange coloured UFO low in the sky above the town. The object appeared to have several spike like protrusions coming out of its structure. The UFO was then seen to disappear from view at high speed by making an angular movement. The incident was not reported. Location – Between Bolton Abbey and Addingham near Skipton, North Yorkshire. Whilst driving with his wife, PS TONY DODD observed a large disc shaped UFO approaching the vehicle from their right. He estimated the size of the craft as being four times that of a car. It was at a low altitude and passed almost directly over the car roof before disappearing behind nearby trees. His wife described the craft as resembling a child’s spinning top. Moments later the same UFO reappeared and swept toward the car once again. PS DODD pulled the car over to a stop and took a series of photographs of the object as it moved away into the distance. 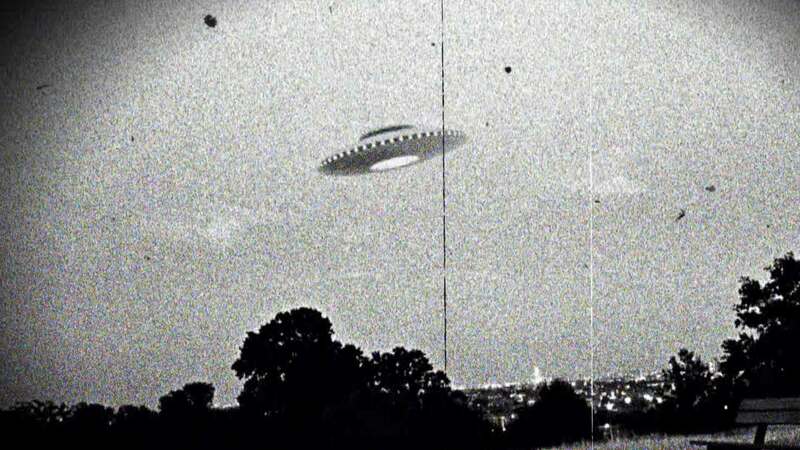 The photographs were later sent to a research facility called Ground Saucer Watch in Arizona that specialise in the analysis of reported UFO images. Their conclusion after analysis was that the photographs had recorded a genuine UFO on film, one of the few to meet their strict criteria. They estimated that the object was 30 feet in diameter and was near spherical in shape. This forms a series of sightings by the officer who later became one of the world’s leading authorities on the subject of UFOs. Two Special Constables had just left Stonehill Police station prior to going onto a nigh shift when they were in a car driving along the A51 dual carriageway when suddenly they were shocked to see a green coloured sphere, the size of a motor car, pulling along side of them as if pacing the vehicle. They watched the UFO for a distance of approximately 200 metres before it veered off the road following the line of some hedges off toward Western Bank. The UFO made no noise whatsoever when it pulled alongside the vehicle. The officers debated whether to try and follow the object but chose not too. Location: Near Burton on Trent, Staffordshire. An off duty Special Constable was driving with his wife on a road near Burton on Trent when they observed a green sphere approaching them from the road ahead. The object was described as being the size of car and at an altitude of 20 feet. It passed directly over their car and out of sight. UFO CLASSIFICATION – CE1 (CLOSE ENCOUNTER 1ST KIND). Off Duty sighting. 1 Officer. Source – PRUFOS Police Database. Following a report by a member of the public an off duty uniformed police officer also observed the object which was described as a yellow sphere that was seen low in the sky approximately half a mile toward Barnby Waterworks. Off duty sighting. 1 officer. Source – MOD Files. Classification – Nocturnal Light (NL). An off duty officer happened to be cleaning his camera at home when he suddenly noticed a strange bell shaped UFO in the sky above his home. He quickly took a single photograph of the object. The officer later learned there had been a series of reports from members of the public in the Stockport and Greater Manchester area. Summer. Sedgley, West Midlands. An off duty police officer was walking his dog in an area called Sedgely Beacon when he noticed three bright white lights high in the sky in the shape of a triangle. As he viewed the lights they moved from his left to right. Then they stopped and remained stationary in the sky for approximately 20 seconds before they suddenly accelerated away at speed and out of sight in a matter of seconds. The officerwas shaken by the incident and did not report it. There were several clouds in the sky at the time of the sighting. Off duty sighting. 1 officer. Source – PRUFOS Police Database. Classification – Nocturnal Light (NL). An off duty officer, PC LEN HAFFENDEN, was walking his dog near his Holybourne home when he observed an intense white light in the sky that descended at a 30 degree angle to stop and hover. He ran home to get his binoculars. His wife and son returned to where he’d seen the object. It was still there and through the binoculars he observed what appeared to be a shuttlecock shaped object. He described the object as having a very bright light at its centre with a misty fluorescence trailing behind. The object was last seen moving toward the horizon and moving into cloud. UFO CLASSIFICATION – NL (NOCTURNAL LIGHT). Off Duty sighting. 1 Officer. Source – Hampshire Chronicle, Winchester 15/06/90. 1845-1940 hours. 29/01/1988. Alton. A uniformed officer observed a bright conical shaped UFO above Alton. The object had a tail and was seen for 55 minutes. UFO CLASSIFICATION – NL (NOCTURNAL LIGHT). Off Duty sighting. 1 Officer. Source: FOI documentation. 1930 hours. 18/02/1988. Bradford, West Yorkshire. An off duty police officer and his wife and children were travelling along Toller Lane, Bradford towards Bingley when they observed several white lights in the sky travelling in the same direction. The object was described as being the size of a small light aircraft. The UFO was then seen to make and abrupt turn and accelerate at high speed away from them. They could not discern any noise above that of the vehicle they were travelling in. UFO CLASSIFICATION – NL (NOCTURNAL LIGHT). Off Duty sighting. 1 Officer. Source: FOI Documentation. 01/12/1988. 1810 hours. Taunton, Somerset. Two off duty police officers observed a bright blue light in the sky from the village of Oake near Taunton whilst staying with friends which included a serving army officer. The object moved steadily in a south west direction across a cloudy sky heading towards the village of Willington. Off duty sighting. 2 officers. Source – MOD Files. Classification – Nocturnal Light (NL). 23/10/89. Late Evening. Location: Delamere Forest, Cheshire. An off duty police officer and his wife were driving through Delamere Forest when they observed a triangular shaped UFO that stopped at one point and hovered above their car. On the same evening several members of the public reported seeing unusual light formations above the road between Glossop and Manchester. UFO CLASSIFICATION – CE1 (CLOSE ENCOUNTER 1ST KIND). Off duty incident. 1 Officer. Source – Metro News 10/11/89. 02/10/1989. 0230 hours. Balmoral Castle, Scotland. An off duty Metropolitan police officer observed an extremely bright white light in the skies above Balmoral Castle during the early hours of a clear and frosty morning. The object was initially seen east of the castle at a 54 degree elevation before moving west which included a loop around a star. Off duty sighting. 1 officer. Source – MOD Files. Classification – Nocturnal Light (NL). 2010 hours. 02/09/1990. Edmonton. An off duty special constable was in his garden when he observed steel grey spherical shaped UFO in the distance. The object moved smoothly across the sky and then accelerated away at speed. Seen for 20 seconds in a clear sky. 1330-1400 hours. Location – Dundee, Tayside, Scotland. Whilst looking out of his living room window the officer looked toward Sidlaw Hills that overlooks Craig Owl when he saw a strange movement in cloud. As he looked at the object he realised that he could make out a sphere like object that appeared to have no real substance to it. As he watched it the UFO began to change shape as it appeared to ‘dock’ beside a communications mast beside Craig Owl. The object turned on its own axis before changing from sphere to an oval shaped UFO. He estimated its size as approximately 50-100 feet in diameter. He observed the object for 1-2 minutes. The object made a sharp movement and began to follow the contour of the hillside until it was out of sight. 30/03/1993. 2100/ 2200 hours. Quantock Hills, Somerset. An off duty uniformed police officer was leading a group of scouts in the Quantock Hills when they observed a large object in the sky coming from the north. The object was seen low in the sky and resembled two aircraft fixed together by a line of bright lights. Note – this sighting may link to the major series of police sightings seen later that night that passed over the south west area of Britain in what has become known as the ‘Cosford Incident.’ One Officer. Off duty sighting. 10/08/1993. Tuesday. 1300 hours. Goonhaven, Cornwall. An off duty uniformed police officer and his sister observed two silver white UFOs as they drove on the B3285 near to Goonhaven in Cornwall. They observed one object travelling directly in front of the other in close formation. They were seen for approximately 10 minutes at a 45 degree angle to the ground. One Officer. Off duty sighting. Source: MOD Files. 11/11/1994. 2200 hours. Pendle Hill, Lancashire. An off duty police officer, his wife and several neighbours observed several rings of hazy pulsating white lights which appeared to swing two and fro across the sky at an altitude of 200 feet above their house which was located close to the TV mast on Pendle Hill. Source: MOD Files. One Officer. Off duty sighting. Source: MOD Files. 05/12/1994. 0430-0730 hours. Aberdeen, Scotland. An off duty uniformed police officer whilst at home when he observed a bright white light with bright red lights against a clear sky as it passed 5-10 miles south east of Aberdeen. Initially the officer believed the lights to be an aircraft but as the incident developed the officer stated the movement of the UFO ruled out that out as an explanation. The sighting was reported to the MOD. One Officer. Off duty sighting. Source: MOD Files. 19/10/1995. Night. Cardiff, Wales. On a clear night an off duty uniformed police officer reported seeing a UFO above the skies above Cardiff. He reported the sighting to Cardiff Airport and RAF St. Athan but neither confirmed the object on radar. The object was also seen to rotate in an anti-clockwise direction. One Officer. Off duty sighting. Source: MOD Files. 30/10/1995. 0030-0145 hours. Chatham, Kent. An off duty uniformed police officer observed an unknown object displaying red and green lights that moved in an erratic manner as it slowly crossed the sky over Bluebell Hill, Chatham in Kent. One Officer. Off duty sighting. Source: MOD Files. 19/11/1995. 2325 hours. Sully near Cardiff, Wales. An off duty uniformed police officer reported seeing a very bright circular UFO displaying red, blue and yellow lights in the sky above Sully near Penarth, Cardiff. The object was seen at a distance of approximately 1-2 miles against a clear sky and good visibility. The incident was reported to Cardiff police however whilst confirming that he was a police officer he refused to leave his details. One Officer. Off duty sighting. Source: MOD Files. Mid/Late Summer 1997. 0230 hours. Location: Junction of A30/A303, Near Yeovil, Somerset. An off duty police officer was driving to work on a rural road at the above location when he saw what he initially thought was an aircraft. However he soon realised that the object was not an aircraft as it appeared to be stationary. He described the object as being at an altitude of 45 feet above a line of trees. As he drove towards it he began to make out the shape of the object. He described it as a rectangular shaped block, seen side on that was about the size of half a football field! He drove past the object that was on his right. Having wound down his window he did not hear a sound as he did so. Having passed by the object he turned the car around to go back and have a second luck. As he did so he flashed his car main beam at the object which seemed to respond by dipping slightly before moving off at speed out of view. 09/08/1997. 2300 hours. Ashford, Middlesex. An off duty uniformed police officer observed two glowing pink fast moving objects as they moved west to east directly over his back garden in Ashford in Middlesex. Off duty sighting. 1 officer. Source – MOD Files – defe-24-1989. UFO Classification – Nocturnal Light (NL). 01/04/97. 2000 Hours. Heathrow, London. An off duty senior police officer observed an ‘orange blob’ with a fiery tail above the skies over Heathrow, London as it moved to his left to right in a northerly direction. The officer observed the object with the aid of binoculars and ruled out that it was the Hale Bopp comet. He described the tail as being twenty times longer than the leading object. He reported the incident to the Daily Mail newspaper but they put it down to the comet despite the officer’s contrary view above. Off duty sighting. 1 officer. Source – MOD Files – defe-24-1988. Classification – Nocturnal Light (NL). 0500 hours. Friday 10/09/99. Location – Weston Zoyland, Somerset. An off duty uniformed officer and his wife observed a very bright UFO moving at high speed in the sky above Weston Zoyland. The object became stationary and he observed it through a telescope for approximately 15 minutes before it sped away at great speed. He described the object as having a spherical underside whilst on top it had a faint red glow. Between 2115-2230 hours. Saturday 21/08/99. Location – Crofton, Wakefield, West Yorkshire. PRUFOS founder GARY HESELTINE was sitting in his garden looking up at he summer night’s stars when his partner, alerted him to some lights flying overhead. The officer looked in the direction she was indicating and observed three white lights moving in a perfect arrowhead triangular formation. They crossed the sky at an elevation of 60 degrees from left to right against the night landscape. The objects appeared to be at a very high altitude and were brighter than the background stars. The officer initially thought that the lights were part of one object but soon realized he could see stars between the triangle of lights indicating three distinct UFOs. No audible noise could be heard. The formation slowly moved above the roof top of the house in a west to east direction. After approximately 20 seconds or so the formation began to ‘bank’ northwards (left) in what was quite a sharp turn. Amazingly the lights turned and banked as one and never deviated from the arrowhead formation. The officer was puzzled by the lights for several years and dismissed the sighting as being that of a triangular satellite formation (which do exist). However recent enquiries and discussions on the subject have persuaded him that the objects were indeed UFOs because it is believed it would be impossible for a satellite formation to perform such a tight banking manoeuvre over such a short distance. The officer was previously in the Royal Air Force and has a keen interest in aircraft recognition. Ballymena to Larne, County Antrim, Northern Ireland. Evening. An off duty officer was travelling on a country road with his wife when suddenly they were confronted with a brilliant white light hovering above the road at an altitude of 300 feet. Amazed they drove to within four hundred metres of the object when the officer told his wife to stay in the car whilst he approached on foot. He walked to a point directly underneath the light. The light emanating from the object illuminated the area around it including where he was stood beneath it. The object hovered in total silence above for several minutes until it suddenly accelerated at great speed away toward the Scottish coast. Early evening. Winter. Location – Colchester, Essex. An off duty uniformed traffic officer was out jogging we he observed a slow moving light low in the sky above Colchester. His first thought was that it was a military aircraft however as it passed directly over him he was struck by the fact that he could not detect any sound whatsoever. He described the UFO as being triangular in shape and definitely ruled out a helicopter as being responsible. The object was seen travelling from South to North. The object was also moving too slowly to be a Galaxy transport aircraft. A member of the public also reported seeing the same object. 08/05/2000. 0130 hours. Glasgow, Scotland. An off duty uniformed special constable and his wife observed a red circular object in the clear skies above his home near Kingston Bridge in Glasgow. As he watched the object changed shape from round to anelliptical shape. 05/04/2000. 2230 hours. Humberside Airport, Humberside. A fast moving large chevron shaped UFO with twinkling orange lights was seen for approximately 90 seconds by an off duty uniformed police officer walking his dog and accompanied by his neighbour as it passed over Humberside Airport at a distance of one mile. No noise could be heard being emitted from the object which was estimated to be at a height of 1000 feet and seen against a clear sky. 16/03/2000 2137 hours. Darlington. An off duty uniformed police officer and his wife along several neighbours observed a large broad formation of unidentified lights which passed over their back garden in Darlington. The objects were seen initially against a clear sky initially before changing to thin cloud as they headed south in the direction of North Allerton. 2003 hours. Tuesday 06/11/01. Location – Rochdale approaching the M62 motorway in Lancashire. The off duty uniformed officer was with one other person when they saw a bright light which gave the impression of being a cluster of smaller lights sat between two areas of red light. The red lights oscillated between various shades of the colour. The UFO appeared to hover for a period of ten seconds before moving off at a tremendous rate of acceleration that was seemingly from a standing start. The object moved off in a 40 degree arc out of sight taking only four seconds to do so. The weather was broken cloud with intermittent rain. There was no obvious sound associated with the object above that of the surrounding road noise. The UFO was seen at an elevation of thirty degrees. This forms part of a series of three sightings by the officer. 11/08/2001 0635 hours. Location – South Shields, County Durham. A Northumbria police officer began to drive his car out of his drive on his way to work. As he turned right he had a view towards a local technical college. He noticed a cigar shaped object hovering above it. He discounted the shape as an airship. He then walked approximately 40 yards to his garage looked again but the object had disappeared. The officer had spent 14 years in the RAF and was very familiar with aircraft of many types. He did not report the incident fearing ridicule from his fellow colleagues. He later became aware that several members of the public had reported seeing a UFO in the area. The weather at the time of the sighting was bright, sunny with excellent visibility. 03/04/2001. 0235 hours. Chippenham, Wiltshire. An off duty uniformed MOD police officer observed two objects 100 metres apart as they flew over the sky north of Chippenham. Each light was described as having a double flashing light that pulsed every second. The UFOs were seen at an estimated altitude of 1000 feet and ess than a kilometre from the location of the officer. A small jet aircraft was also seen to be following both of the objects as they passed by the witness. There was no cloud in the sky and the visibility conditions were excellent. Duration of sighting – 10 seconds. One Officer. Off duty incident. Source: MOD Files. 05/11/2001. 0030-0330 hours. Hamilton, Warwickshire. An off duty uniformed police officer and his wife observed a classic saucer shaped UFO from their garden which had white, red and green lights on it. It initially moved on a horizontal flight path until it reached Hamilton when it suddenly shot vertically into the clear sky. The officer recorded part of the sighting on his video camera. He then contacted the local police station who told him no other reports had been made. He also checked with Glasgow Airport again with a negative result. One Officer. Off duty sighting. Source: MOD Files. 0316 hours. Sunday 07/04/2002. Location – Hellifield near Skipton, North Yorkshire.The uniformed officer was off duty having just completed a 5-3 shift. As she pulled off the A65 near Hellifield to look for the comet Ikeya-Zhang she caught sight of a triangular formation of lights moving in what seemed perfect unison. The white lights moved slowly across the sky and at one point made a slight ‘banking’ manoeuvre seemingly moving as one. She is not sure whether she was looking at one large triangular object or three distinct objects. An avid stargazer she is well used to looking at the night sky at various times of the year. Seeking corroboration she had the presence of mind to ring her sergeant who was driving home on his way to Otley, West Yorkshire. He stopped his car and from his location witnessed the same triangular formation. His corroboration came two minutes after the initial sighting. The object(s) faded out of view low on the horizon. This forms part of a series of three sightings by the officer. October/November 2002. 2200/2300 hours. Balcombe, Sussex. An off duty uniformed police officer observed a rectangular shape approaching his direction from a 20 degrees angle to the ground. He could not see the object itself but its outline blotted out the stars and he described it as rectangular in appearance. The officer was unable to gauge its altitude as there were no points of reference but it appeared to be massive – covering about two palms width of his outstretched hand. The object moved slowly – slower than a light aircraft and did not make any sound and nor did it have any navigation lights or other distinguishing features. He had a clear unobstructed view of the object as it passed directly overhead in an easterly direction. Thesighting lasted approximately 30-45 seconds. One Officer. Off duty sighting. Source: PRUFOS/Confidential. 13/06/2004. 1700 hours. Location: Oval Cricket Ground, London. Two off duty police officers and two civilian police employees were watching the Surrey v Kent cricket match when one of them spotted what appeared to be a pole/cigar shaped object in the sky. They were able to view it through binoculars but failed to identify it. It was travelling very slowly and rising gradually higher into the sky. The UFO took 20-30 minutes to pass over them. UFO CLASSIFICATION – DD (DAYLIGHT DISC). Off Duty sightings. 2 Officers. Source – PRUFOS Police Database. 11/02/2004. 2105 hours. Holbeach, Lincolnshire. An off duty uniformed police officer was at home when he observed two bright lights in the clear sky above the town of Holbeach in Lincolnshire. The objects were moving rapidly in a SSW to NW direction on a horizontal flight path. As the officer continued to watch them the second object made an instant 180 degrees turn. He reported the sighting to RAF Wittering who advised RAF Neatishead. One Officer. Off duty sighting. Source: MOD Files. Early evening. April. Location: Crofton, Wakefield, West Yorkshire. PRUFOS founder DC GARY HESELTINE observed a white sphere approaching his home from an easterly direction. He then observes the same object through binoculars confirming that the object possess no navigation lights, there was no noise and the officer was able to confirm the shape of the UFO i.e. sphere. The object was also seen briefly witnessed by officer’s fiancée. Off Duty sighting. 1 Officer. Source – Author and Founder of PRUFOS Police Database. 2153-2157 hours. 15/09/2007. Location: Yeovil, Somerset. An off duty sighting by Special Constable PC STEPHEN MAINS. Having gone outside his home to have a cigarette he noticed a bright orange object moving slowly across the sky to the east. As it did so he then saw that there were two other orange lights that appeared to be moving in formation nearby. All three objects then passed directly over his home at which point the officer called his wife to observe the objects who corroborated the sighting. UFO CLASSIFICATION – NL (NOCTURNAL LIGHT). Off Duty sighting. 1 Officer. Source: The PRUFOS Police Database. 01/01/2009. 0005 hours. Cardiff, South Wales. An off duty uniformed police officer and his wife observed an orange light as it passed silently over the skies of Cardiff in silence at an altitude of 5000 feet. The object was seen for approximately 10 seconds before it disappeared from view. Then a second object was seen for several seconds before it too disappeared however this object came from a different part of the night sky. Then a third light was seen moving from east to west. Again a 10 second duration before vanishing. Significantly this object was considerably larger than the first two. He later mentioned the sighting to other police colleagues who put forward the idea of Chinese lanterns but the officer ruled that out stating that all three objects were seen moving in different directions in the sky with flight characteristics completed different to floating lanterns. Note the officer had previously served in the RAF and was very familiar with aircraft. Off duty sighting. 1 officer. Source – PRUFOS Police Database. Classification – Nocturnal Light (NL). 25/09/2009. Formby, Merseyside. An off duty police officer PC STEVE MILES observed a silent triangular shaped UFO that made no noise, had no navigation lights and who was certain it wasn’t an aircraft as it passed over the skies of Formby in Merseyside. A week earlier the press had reported that a member of the public had seen a similar object. One Officer. Off duty sighting. Source: MOD Files. 01/01/2010. 0010 hours. Cononley, North Yorkshire. An off duty North Yorkshire police officer was at home near Cononley looking at New Year fireworks when a bright orange light moving from the direction of Keighley toward Cononley caught his attention. He described the object as the shape of a squashed ball. As the object reached the Cononley area he suddenly observed the UFO turn left towards Cowling and the Lancashire border. It then began to rise steadily into the sky and out of sight. He then noticed a second orange light which followed an exact path as the other including a definite turn. Then he saw two more orange objects stacked directly above each and once again the same manoeuvre was completed. The total duration of the event was three to more four minutes. He completely ruled out the possibility of the lights being Chinese lanterns. The objects moved in total silence at a speed described as like an aircraft. 03/06/2010. 1530-1600 hours. Consett, County Durham. Two off duty officers observed a huge dark coloured cylindrical object as it passed over their home near Consett. In what was a bright clear daylight sky the object was seen to rotate on its own axis in a vertical position before slowly moving in a tumbling motion as it slowly crossed the sky. The duration of the sighting was approximately 30 minutes and was partially captured on mobile phone video footage and in a series of mobile phone photographs. The object was estimated to be at an altitude of 1000-5000 feet with dimensions of approximately 200-400 feet in length. Two Officers. Off duty sighting. Source – PRUFOS/Confidential. 10/02/2011. 1545 hours. Consett, County Durham. One of the above officers observed what appeared to be a very similar object from his home as it travelled in the sky close to the town of Consett. On this occasion it appeared to be tumbling at an altitude of approximately 5000-8000 feet but at a much faster rate of speed across the sky. He observed the object for about 30-40 seconds and estimated that the object was approximately a half mile from his location. One Officer. Off duty sighting. Source – PRUFOS/Confidential.